Two drummers, two guitarists, and one trumpet. 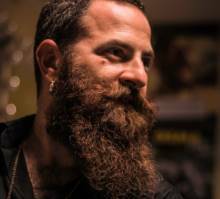 Avishai Cohen has been a star in the international jazz scene for many years and is considered one of the best trumpet players in the world. The band has performed in downtown New York and developed the project’s unique sound which combines rock & roll, psychedelic, groove, jazz and more, all in wonderful synergy. Avishai selected a non-standard composition for this project in Israel. A composition of two drummers, two guitarists and no bass, and as a result a new and uncharacteristic space opens up which allows musicians to reach to new realms .